Selling transpired in Wall Street on Wednesday, as a drop in Treasurys, due to 10-year swap spreads going negative for the first time, caused for the retreat in equities. Interest rates for Treasurys to help fill the need for the new debt issued. My ETFs that I purchased as an interest rate hedge (post from last week) performed very well today and I believe there are more gains to come. It comes back to the simple economic principle of supply and demand. We know the amount of US debt that has been issued and continues to be issued and it is only a matter of time until "the demand" weakens. We saw that today. As a result of the drop in Treasurys, we also saw a rise in the dollar. The dollar has been performing very this last month and was helped more today, due to the downgrade of Portugal's credit rating. UUP is one of those good rocks for me that keeps chugging away and brings in moderate returns. 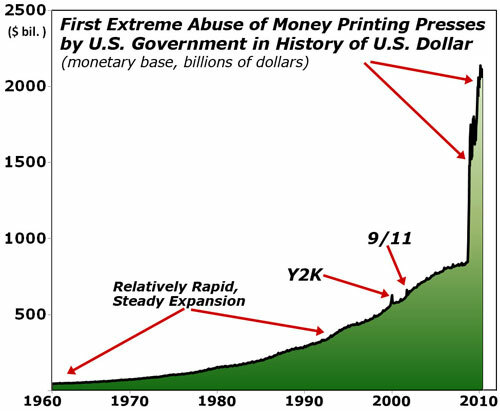 However, continual abuse of currency printing will eventually bring the dollar to worthless values (see chart below). “When I was named president of the Federal Reserve Bank of Kansas City in 1991, my 85-year old neighbor gave me a 500,000 mark German note. He had been in Germany during its hyperinflation, and told me that in 1921, the note would have bought a house. In 1923, it would not even buy a loaf of bread. He said, ‘I want you to have this note as a reminder. Your duty is to protect the value of the currency.’ That note is framed and hanging in my office. “Someone recently wrote that I evoked ‘hyperinflation’ for effect. Many say it could never happen here in the U.S. To them I ask, ‘Would anyone have believed three years ago that the Federal Reserve would have $1.25 trillion in mortgage-backed securities on its books today?’ Not likely. So I ask your indulgence in reminding all that the unthinkable becomes possible when the economy is under severe stress. “If German hyperinflation seems an unrealistic example from the distant past, then let’s come forward in time. Many have noted that in the 1960s, the Federal Reserve’s willingness to accommodate fiscal demands and help finance spending on the Great Society and the Vietnam War contributed to a period of accelerating price increases. Well, at least some of the leaders are aware of whats going on. Happy Trading. And then there may be your longtime rolex replica submariner along with dedicated ally, as their crew features out of the blue captivated a new next immediately after the against-all-odds vacation to your Stanley Glass Finals. Confirm you're a new supporter via made use of using fake omega a new 60's "throwback" hat. These kind of vintage-style baseball jerseys resurrect patterns via during the entire NHL's virtually century-long record, and they are offered while basically qualified reproductions much like fashionable jerseys. Developer enjoy employs your natural material although duplicate has built replica watches uk by simply updating the main material. By way of example - a new platinum enjoy is constructed from natural platinum plus the duplicate of these initial enjoy are going to be built employing gold-plated product. You will find there's difference throughout the standard of replica rolex daytona create also. Your distinguished Swiss enjoy company in the enjoy sector, Audemars replica rolex gmt features unveiled his or her most up-to-date invention. Audemars Piguet duplicate enjoy will be the minimal format wristwatch containing been recently replica hublot drastically acclaimed with the enjoy fans throughout worldwide.